Blues guitar virtuoso Buddy Guy succeeds on every level from soul to sizzle to showmanship. BOOK SERIAL: Ambient Deviant Speedmetal Polka Chapter 22. This is an excerpt from the forthcoming book, “Ambient Deviant Speedmetal Polka: Rock Writing, 1990s to 2010s, Los Angeles” by John Scott G.
Before he can reply, Randy Holland chimed in with, “I can top that!” Randy, along with co-promoters Rob Anderson and Ginger Greaves, was a driving force behind the Temecula Art Beat of Blues Festival, the event that was swirling around us. Buddy Guy inspires that level of commitment in his fans. Less than an hour later, Guy and his band took the stage and delivered a performance that seemed as if it was dedicated to celebrating Randy’s defeat of The Big C. It was one of those shows that created its own conception of time. It was an entity unto itself that removed all thought of the outside world. The only downside to the show was that it flew by at amazing speed. Guy himself was a marvel of dynamics, bent notes, stage presence, rockin’ blues grooves, and great old-fashioned showmanship. 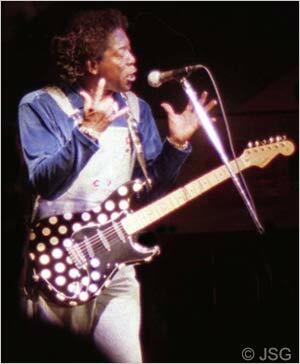 The main thing is that he played his polka-dotted Fender Stratocasters like they were extensions of his soul. During several solos, just as things were really soaring, Guy brought the volume down, causing a delicious hush to fall over the crowd. Everyone sucked in their breath and leaned forward in their seats to be sure to catch every note. Then, at just the right moment, he smacked the tune back to full volume; the effect was marvelous and the audience erupted in joy every time, each response more effusive than the last. Buddy Guy can coax almost any sound from his instrument. He caressed the strings and the guitar purred; he stroked them and the guitar roared; he manipulated them and the guitar screamed. In one solo, he tapped out notes and chords using a drumstick; on another solo, he used a coil of his guitar cable to bounce some sounds at us. He also churned and crunched a wailing solo while striding through the arena, eventually winding up in the Ladies Room (to the considerable consternation of the overly uptight security people). When he returned to the stage, he introduced a new song, “I’ve Got a Problem,” and in illustration of the lyrics, a violently bent note snapped the high E string on his axe. Undeterred, Guy finished the solo playing on the remaining five strings. He then switched to a second polka-dotted Strat, this one with APC pickups (instead of the dreaded Lace Sensor pickups that used to be part of Fender’s Buddy Guy Signature Series guitar) and the tone was immediately brighter, bigger, richer, fuller. The show was terrific and so was the band: Tony Z was ultra-funky on keyboards, Scott Holt delivered slick rhythm guitar, Greg Rzab offered groovy-smooth bass, and Ray “Killer” Allison provided expertly-controlled and well-modulated detonations on drums. “This Guy can do anything with a guitar,” one listener exclaimed excitedly. I’m not even sure he was intending the pun but the observation works either way. Excerpt of book serial “Ambient Deviant Speedmetal Polka: Rock Writing, 1990s to 2010s, Los Angeles” is Copr. © 2013 by John Scott G – all commercial and reprint rights reserved. This version first published on Ga-Ga.com, a publication of Neotrope®. Photography of Buddy Guy is Copr. © by JSG and used with permission. The post Oh Buddy: This Guy is Great – Blues guitar virtuoso Buddy Guy succeeds on every level appeared first on MuseWire.